When we said our goodbyes to Crete, Greece and I retired my 5 year blog entitled “Cretan Chronicles” (www.cretanchronicles.wordpress.com), many of my friends there asked if I would consider starting a new blog – perhaps calling it Colorado Chronicles. Although there is a great deal to blog about in my home state, my sights are set on travels and experiences beyond the boundaries of this beautiful area of America. And my focus is on how to preserve and share with others the treasured morsels of wisdom that I gleaned in Crete about intentional living and deeper sensitivity to life around me. And so, “Slow Food for the Soul” was born. But as much as I love to travel, I’m keenly aware that you don’t need a passport or ticket to far away places to find beauty and adventure. Sometimes, the best memories are made right in your own back yard. So, how appropriate to begin with a little introduction of my own stomping grounds here in Colorado. Camping and Colorado are synonymous. So are “kitchen remodel” and “major headache.” After three weeks of cooking on a single portable electric burner and washing dishes in the laundry room sink, we felt like we were camping in our own home so we decided we might as well take this show on the road. Our first thought was to head west to Moab, Utah and take in the desert magic of Arches and Canyonlands National Parks. But as the departure date neared and temps there soared into the 90’s, we chalked that idea up for a cooler autumn trip and headed south to the San Juan Mountains of Colorado. But a new day brings optimism and breaking camp early the next morning, we set off south towards Aspen through Carbondale and Redstone. 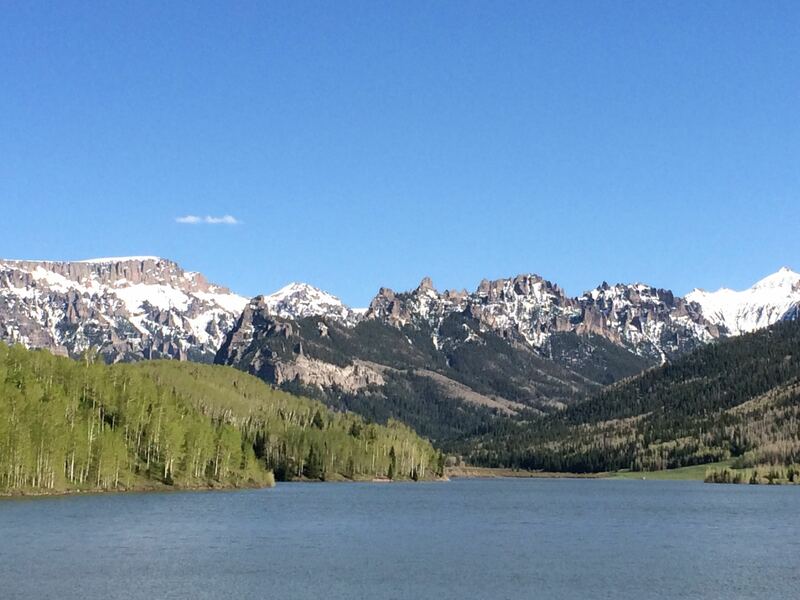 The views alone were energizing, and as we followed the Crystal River with the massive Mt. Sopris looming before us, the previous sleepless night was a distant memory. 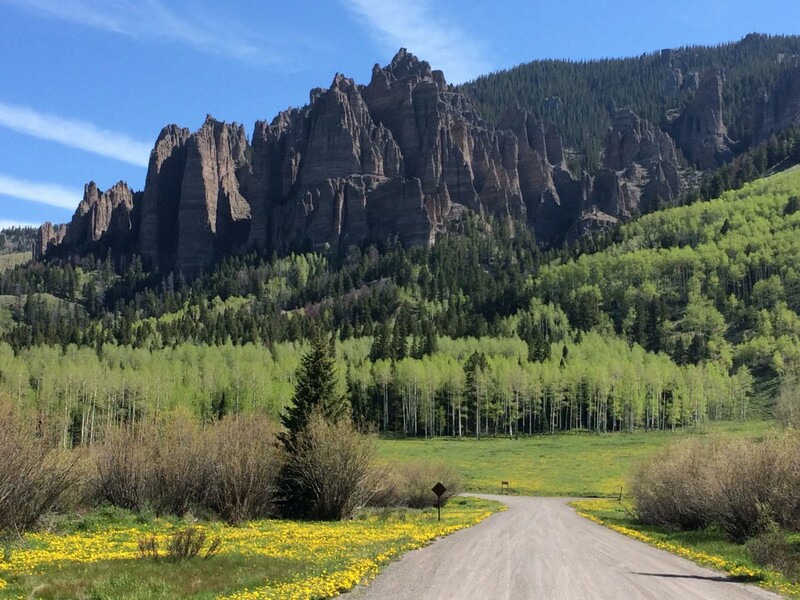 The road over McClure Pass dumped us out into the Uncompahgre Valley where the Ute Indians lived and flourished in the 1800’s. 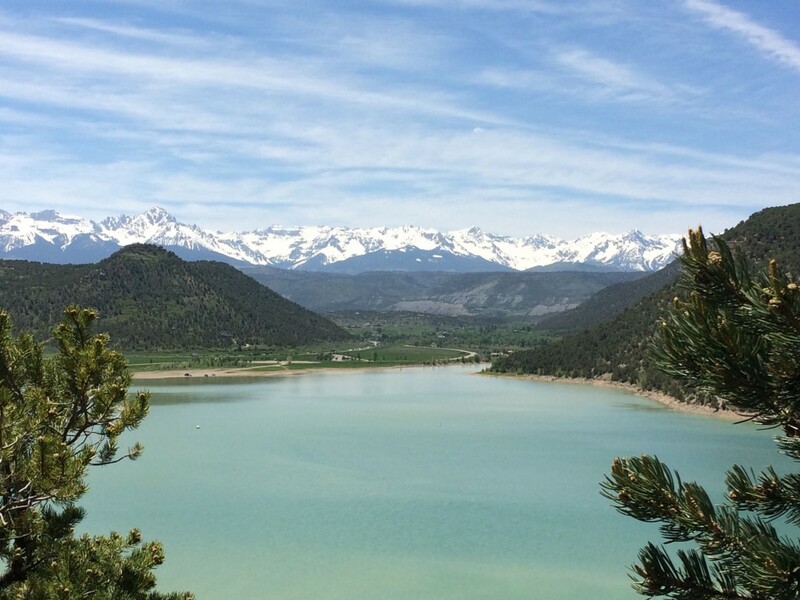 This fertile valley is home to little agricultural towns like Hotchkiss and Paonia and it boasts some of Colorado’s finest produce. 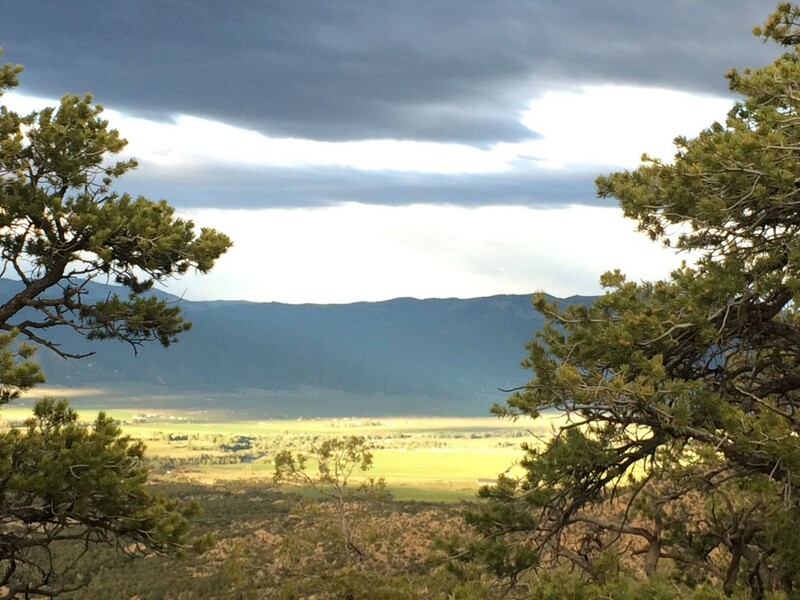 The North Fork Gunnison River meanders through June-green ranches and farms, generously giving its precious water to fields, orchards and vineyards. One of our favorite vineyards is a little family run operation called Black Bridge Winery near Paonia. Tucked back on a country road and on the banks of the river, this farm is an oasis where you are invited to stop by, picnic on the lawn under the shade of the cottonwood trees and, if you like, enjoy a free wine tasting. The store is full of homemade jams, soaps, honey and wine. Our favorite is a red blend called Black Bridge Breaker Row. We headed out toward Ridgeway/Montrose intending to possibly camp in Ridgeway State Park near the reservoir but decided to take a detour (thanks to photographer John Fielders book, “Best of Colorado” – highly recommended.) We drove a nicely graveled road – Cimarron Road – winding 20 miles through a valley, over hills dotted with pristine ranches and the dramatic Sneffels mountain range growing ever closer. This was where the original movie “True Grit” starring John Wayne was filmed. The scenery was intoxicating and it didn’t take any second thoughts to make the decision to find a campsite in this beautiful area. 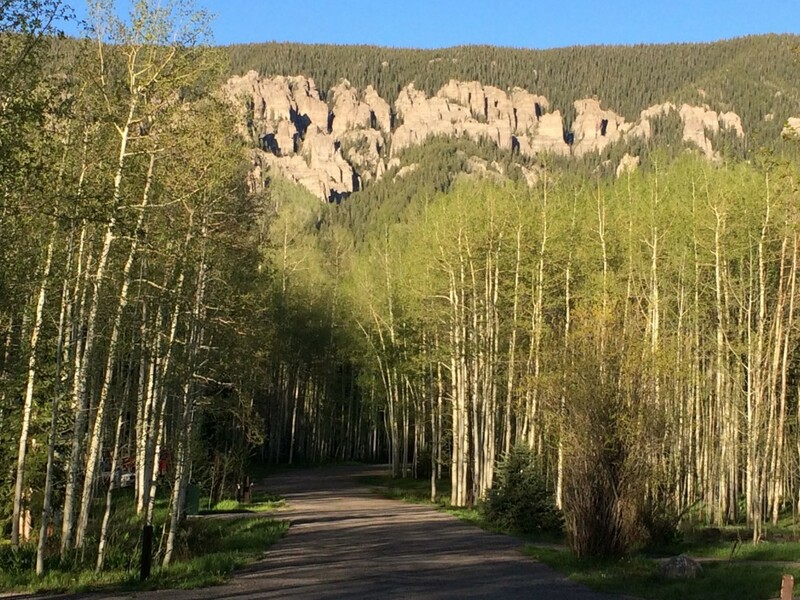 We turned off at the nearly empty Silver Jack Campground and set up camp in a forest of stately aspen trees high above the Silver Jack Reservoir. 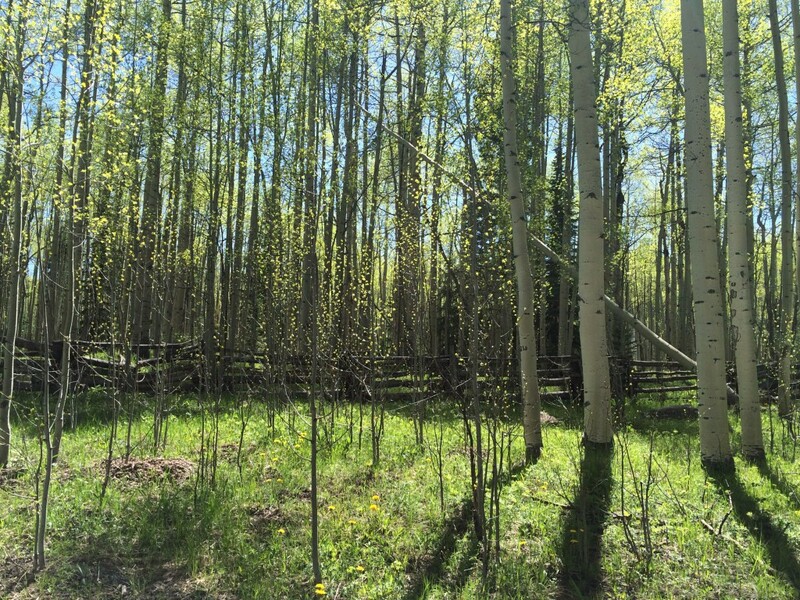 After an afternoon walk down to the water, we enjoyed “happy hour” at my favorite venue – under a canopy of tall aspens with the Colorado blue sky peeking in above us and a carpet of green laid out before us. The only thing better than happy hour with a great bottle of wine is happy hour with great wine, comfy camp chairs, fresh mountain air, long summer afternoon shadows and my best friend (who also happens to be my husband.) We sat silently and watched the evening sun melt behind the aspens and touch the eastern cliffs with gold. The next morning, our adventuresome spirits got us into a little trouble as we skirted past a closed gate and ascended Owl Creek Pass (a short cut down into Ridgeway and highly recommended again by Fielder.) We weaved our way around fallen trees that were uprooted by heavy spring snows and marveled at the open views as we went higher. But it wasn’t long before we realized why the road was closed. After high-centering our Subaru in a snow bank, we dug out with some firewood and a dustpan (Note to self: Purchase a decent camp shovel!) only to look ahead 100 feet and see a giant fallen tree completely blocking the road. Somewhat shamefaced, we backtracked out past our campsite, up the Cimarron Valley and out to Ridgeway State Park. We set our sights on the charming and picturesque historic mining town of Ouray (named after the great Native American Ute Chief) for the night. On the way, we stopped to indulge in a hot springs soak. Just south of Ridgeway is Orvis Hot Springs – a non-assuming, verging-on-tacky, little building with a gravel parking lot and a tiny entrance. If you blink, you’ll miss it. As we approached the reception desk, a young woman with a no-nonsense but friendly demeanor welcomed us and accepted our $16 per person entrance fee while casually mentioning the “bathing suit optional” policy. She then escorted us through the building pointing out the showers and changing rooms, the complimentary coffee/tea kitchen, the private tubs and sauna – all very simple and slightly tired looking. Finally, opening a creaky screen door in the back, we were greeted by an astonishing sight – a beautiful private garden oasis, embellished with landscaping profuse with flowers, budding trees, fountains and waterfall-adorned pools. After three hours of soaking our tired and sore bodies we looked like happy prunes and reluctantly left Orvis behind to continue on to Ouray. The historical town of Ouray is nestled under huge cliffs at the base of the San Juan Mountains and its streets are lined with restored Victorian homes and shops. 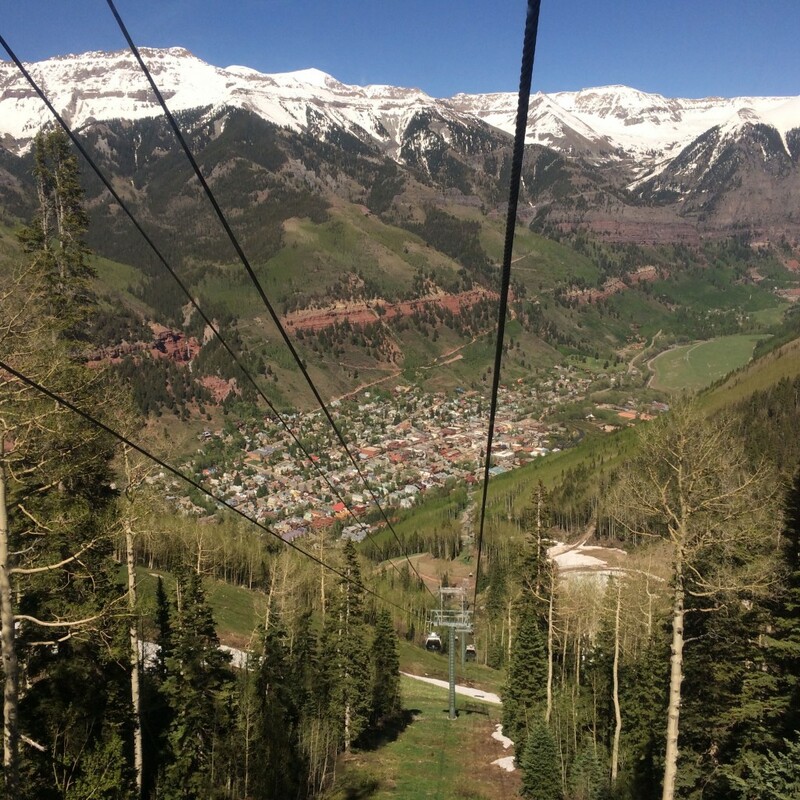 The close proximity to hiking and jeeping trails, hot springs pools, top-of-the-world views and the famous celebrity town of Telluride with its music festivals, makes Ouray a high altitude wonderland. We treated ourselves to a hotel room that night at the Hotel Ouray currently under new management and being lovingly updated by Patty and her husband Patrick (https://www.hotelouray.com.) Guestroom #9 was a nicely restored room overlooking the old town of Ouray and within earshot of the nearby thundering Cascade Falls. 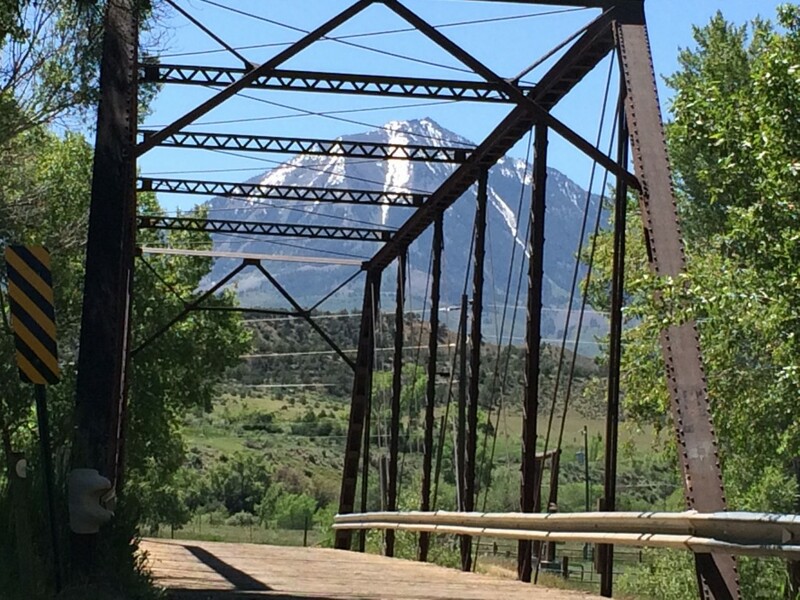 The drive to Telluride was another unexpected bonus as we took the road less traveled. Last Dollar Road is a pleasing gravel road that meanders through valleys full of grand ranches reminiscent of Bonanza. Most of the route was an easy grade but the last few miles were narrow and precipitous as we descended to Sawpit and continued on to Telluride. Telluride sits at the base of a sheer box canyon surrounded by cliffs, forests and dramatic waterfalls, and is rich with the history of the Ute nation as well as mining ventures. Today it hails as a topnotch ski area in the winter and the scene of world famous music festivals in the summer. Once a sleepy little mining town, Telluride has grown up and is a favorite playground for celebrities and locals alike. The infusion of new money in the 90’s, helped put Telluride on the map as a topnotch mountain resort with quintessential western appeal. A ride up the gondola provides stellar views of the town and its surroundings. After camping one night at the disappointing Sunshine Campground we woke to a change in the weather. Cool temperatures and the threat of precipitation urged us to hurriedly eat and then break camp just as sprinkles of rain beaded up on our jackets. The beautiful Lizard Head pass that descends into the lush Delores River Valley has always been one of my favorite stretches of scenic road (part of the San Juan Skyway) in SW Colorado. After stopping in at a great little bakery/café in Mancos (the lemon/blueberry bars are to-die-for), we headed east towards Durango. 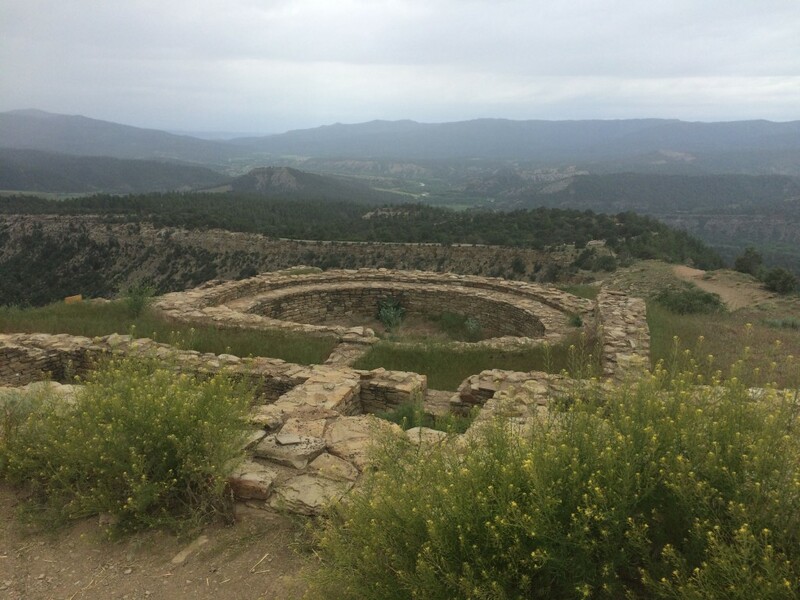 A spontaneous stop at Chimney Rock archeological site proved to be a memorable event as we toured the high ruins of an ancient Pueblo Indian settlement thought to be an offshoot of the Chaco Canyon tribe. It remains a mystery as to why these people settled here but many believe it had something to do with astronomical observations – a type of natural Stonehenge. As the rain worsened we decided to pass on camping and stay in a hotel. 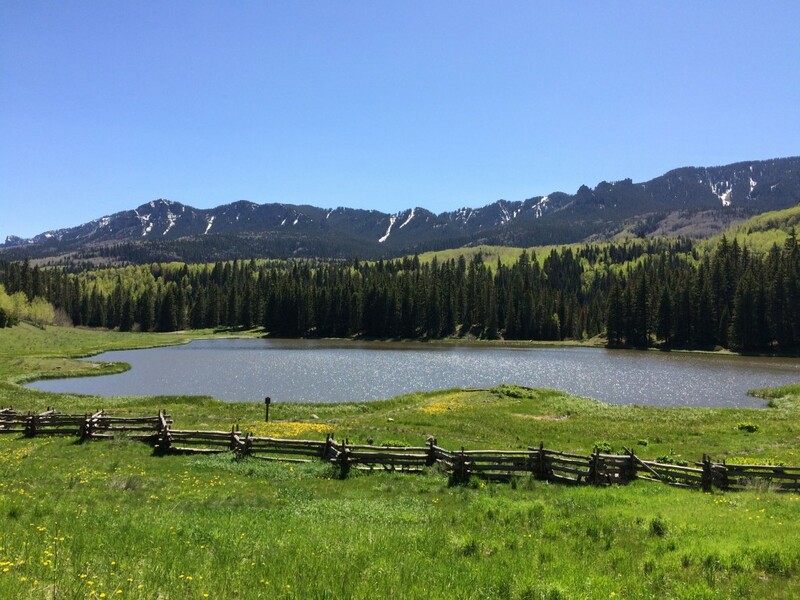 Our plan was to head north from Pagosa Springs on Hwy 149 – The Silver Thread Scenic Highway. Looking at the map and determining approximately where we’d be in a few hours, we called ahead to the little town of Creede to secure a hotel room. Arriving late, we found our hotel right smack in the middle of this once bustling but now sleepy little mining town. Hotel Creede is a historic hotel with four rooms to rent upstairs over the restaurant, a bath down the hall, vintage well-used furniture and faded Victorian wall paper. I seriously think not much except the linens had been changed since 1868. Very quaint and totally authentic, it was clean, quiet and comfortable, especially as the rain beat down overhead. We had dinner at a newly opened restaurant on Main Street called Arp’s where I had THE Best Gumbo. Hands down. Marty, bartender by night, fishing guide by day, entertained us with stories of the area of Creede and how he came to call this little town his home. 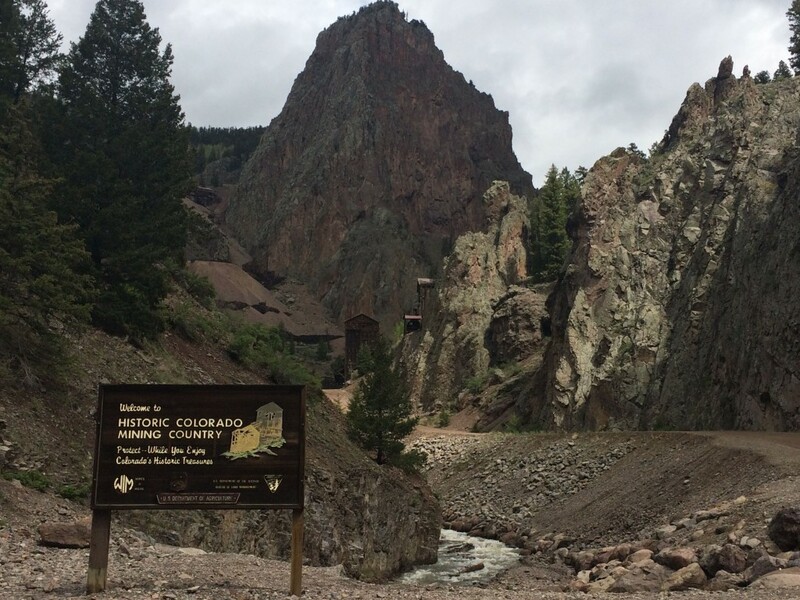 He encouraged us to not miss the17-mile Bachelor Loop drive up the extremely narrow canyon from Creede through abandoned mines and high aspen groves. It was well worth the time and effort. Before exiting town we stopped at the nicely designed visitors center and a friendly woman gave us some tips to try next time we’re in the area. Campsites recommended were Rio Grande, Marshall Park and Miner’s Creek. And for great burgers, she said to stop in at Freeman General Store. Gotta love the locals! As we drove through the beautiful Rio Grande River Valley I could close my eyes and almost see the early inhabitants – Native Americans and settlers – on these unchanging hills. The river was deceivingly calm as it curved around mountain meadows and approached a huge chasm in the earth. North Clear Creek Falls plunges 100 feet in a showy display of Mother Nature just off Hwy 149 on the way to Lake City. Descending Spring Creek Pass through low moisture laden clouds and mist was a poignant reminder that weather in Colorado can change at the drop of a hat. But cooler weather also typically brings out more wildlife and we were thrilled to spot a mama moose and her twin “mooslings.” Slumgullion Pass (I love that name) is home to beautiful Lake San Cristobal where the Continental Divide high peaks reflect in its cold still waters. By the time we arrived in Lake City at the bottom of the pass, it was a steady downpour so we did a tour of the town in the comfort of our car. Lake City was once was home to over 2,500 people at its peak after gold was discovered here in 1874. The town exploded with miners, families, saloons, churches, brothels and all the colorful characters and activities you’d expect to see in a bustling gold mining town in the late 1800’s. Today it has significantly less inhabitants but is a well established community that has preserved over 75 historical buildings making it the largest historical district in Colorado. This area once rich with mother lode gold is now teeming with year round recreational opportunities. It’s easy to see how Colorado got its reputation as a recreational playground. The wilderness areas surrounding much of our route are packed full with ample opportunities to hike, bike, fish, camp, jeep, ski, snowmobile … and the list goes on. 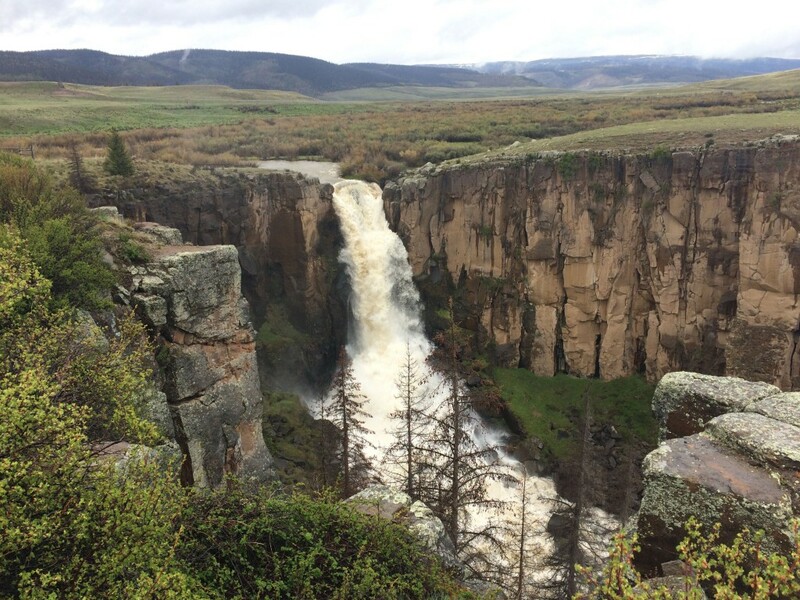 The Gunnison River brings life to its valley of sage-covered hills and cottonwood trees and provides some of the best river activities that Colorado has to offer. 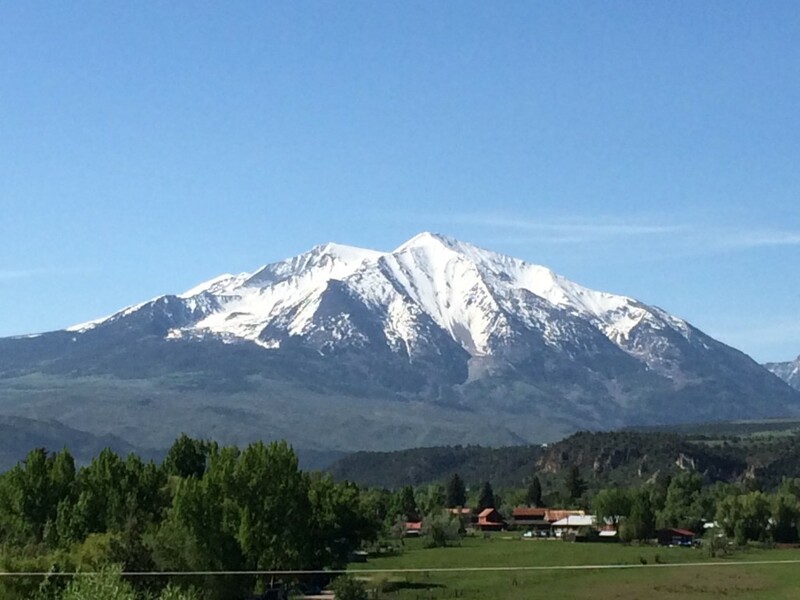 On Hwy 50 from Gunnison, we drove over Monarch Pass and east into the high prairie town of Salida. I have to admit, I’m a little partial to this ranching and artistic community since my Dad bought land there years ago and we enjoyed many family events at the ranch house that laid in the shadow of the dramatic 14,000’ Collegiate Mountain Range. Only a 2 ½ hour drive down beautiful 285 from Denver, the town now is the hub of outdoor activities, hosts an array of art studios and still manages to protect that small town feel. As we prepared to venture up to our camping site outside of Salida, we noticed some significant storm clouds gathering in the west and decided to wait it out by enjoying happy hour at the local microbrewery, Elevation Brewery. After the storm, we set up camp in the shelter of some pinon trees on a ridge looking down into the Arkansas Valley in the east, and in the west, a close up view of another “fourteener” called Mt. Shavano. There are many joys and challenges to camping but perhaps the best benefits are that it causes you to appreciate the moment, to slow down, to expect the unexpected and to stretch your resourceful thinking and imagination in order to engage in the entire experience. 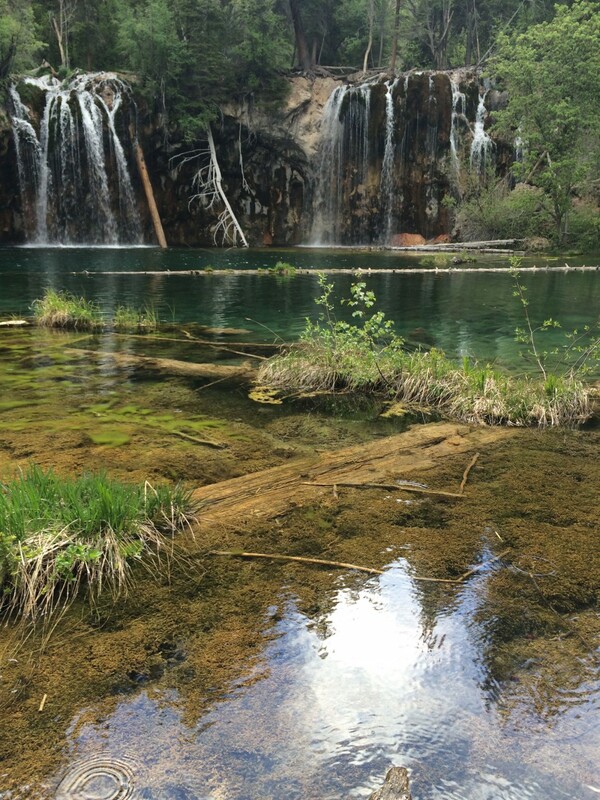 Our short trip around southwestern Colorado renewed our appreciation of the beauty and enjoyment we have available right here in our own backyard. That, and the fact that no matter how soft your REI sleeping pad is, there’s no place like home. Now I really want to see SW Colorado! My husband and I don’t want to explore the typical tourist spots and you presented us with some lovely options. Thanks for sharing your trip!